Thank you to 173 competitors who competed in the final event of the Canterbury Rogaine Series held at Castle Hill on 8 October 2011. Despite snow showers at the start, the weather cleared and the post event BBQ was enjoyed in warmth and sunshine. Searching for Sanity (pictured above visiting checkpoint #69) once again took out the event with a top score of 2250. The team demonstrated their leg speed with an impressive 2:05 split down the scree (from checkpoint #200 down to #20). The village area insert (pictured right) provided amusement for many teams as well as the organisers. It also proved a fantastic opportunity for school students and families to “have a go” at the sport. 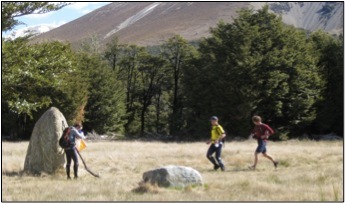 Elite orienteer Tane Cambridge had heaps of fun, and suggested the area was worthy of an orienteering event. The series has sought to encourage a culture of rogaining in Canterbury with the development of exciting new maps, interesting locations and the use of electronic scoring. We hope you have enjoyed it and welcome your feedback (mailto: [email protected]) and suggestions for future events. Thank you to Bivouac Outdoor for sponsorship of event prizes and to Hirequip for providing toilets for the series. To keep informed about upcoming events, join the New Zealand Rogaining Association on their website www.rogaine.org.nz.